As I’m sure you gathered from the title of this post, I work a full-time job, I’m a freelance writer, a blogger and, most importantly, I am a wife and mom to my two precious toddler daughters. Life is busy and full, but I love it! My home is not always clean, I fall behind on both work and laundry, and meals are oftentimes thrown together last minute. But, I’m doing my best and I love my daughters fiercely. My time with them is the most important thing to me. The answer to that is simple: I’m looking to increase my freelancing and blogging income to the point where I can quit my full-time job, and then eventually my husband can quit his job if he so chooses. I’m sacrificing my time now so I can have more of it in the future. Plus, I absolutely love writing and blogging. Now that I’ve given some background on what I do, here is a peek into my current schedule. As a side note, my family and I recently relocated from sunny Arizona to beautiful North Carolina. We purchased our first house out here a few months ago and are really just soaking in all that the state has to offer. We spend our evenings and weekends exploring different parks, going on walks, and playing outside. Monday through Friday is for working, and here is a typical day for me! Wake up time! Thanks to Crystal’s , I am now an early-riser! I accomplish so much more each day when I can start the morning by myself — whether that’s working or just enjoying a cup of coffee in silence. Prior to her course, I started my mornings frazzled. My kids woke me up, and it seemed to go downhill from there. Now, I’m happy to see them each morning, knowing that I’ve had some alone time. My girls are up by 6:00 (on a good day), so I never do anything too strenuous in the morning. I typically have a cup of coffee, plan out my day, do a few sets of exercises and get ready for the day ahead. I also get started with work on my full-time job by checking emails and doing my daily tasks. My daughters are in daycare part-time during the week. I drop them off at 9:00 and then head to my office. My full-time job is 40+ hours per week, but I am able to work from home, which is an added perk. I do go into the office three half-days per week, though. Right after lunch, I pick up my daughters from daycare and we head home for naps. The reason I’m able to work from home is because I was blessed with two amazing nappers. They aren’t the best night-time sleepers and they do wake up extremely early, but I almost always get a three-hour nap out of them each afternoon! From now until about 4:30, I’m able to work on my full-time job, answer personal emails, and brainstorm freelance writing and blogging topics if I have time. My girls are up from their naps and my husband is just getting home from work. This is when I start making dinner, assuming I’ve planned ahead. If not, we head to the store and decide on something as a family. My husband is a rockstar in the kitchen and loves both grocery shopping and cooking. If it weren’t for him, we’d be eating chicken nuggets and spaghetti most nights! Other than cooking and eating dinner, we reserve our evenings for family time. We’ll go to the neighborhood park, pick up some cookies from our favorite bakery, go on a “deer drive,” or stay in and play. Unless something urgent is on my calendar, I never open my laptop during this time. The girls are almost always in bed by 7:30pm (I am a strong believer in an early bedtime). If they’re not tired, I let them read quietly in their rooms for 30 minutes prior to lights-out. Once they’re asleep, I get to working on my side jobs — freelancing and blogging. and work roughly 10 hours per week. Honestly, this is a part of my day that I really look forward to, and I can’t wait until my income is enough to replace my day job so I can focus more on the things that I love. Can’t forget about the hubby! My husband and I stay connected throughout the day by calling and texting each other. He is also up early with me most days so we can chat and have some time to ourselves. In addition, we make sure to always go to bed at the same time. We head to our room around 9:30 and talk or watch TV before falling asleep. This is another favorite part of my day — quiet, relaxing time with my favorite guy. You may be wondering when I have time to clean the house. Well, I clean every morning before leaving for daycare/work and every evening before going to bed. Spending 30 minutes each morning and another 15 in the evening keeps my house in order. On the weekends, I’ll spend another 30 minutes or so cleaning bathrooms, washing sheets and doing other lengthier chores. I also freelance and blog when the girls are napping on Saturdays, but reserve Sundays as a day of rest. If you’re interested in making more money, I cannot recommend freelancing and blogging enough. Not only have I been able to make a decent amount of money from my couch, but I’ve met some wonderful ladies who I feel honored to call my best friends. I started freelancing prior to blogging, but my blog is what launched me into my niche — personal finance. So, if you’re wondering where to start, I highly suggest starting with a blog. Yes, my schedule is busy, but we’re all busy! As I’ve gotten older, I’ve realized that people prioritize things that are important to them. For me, I want more time and more freedom, and that is why I’m working so hard now! Sarah Brooks is a full-time employee, freelance writer and , but most importantly she is a mom to two little girls, Cami and Maisie. She has a passion for helping moms follow their dreams and create a life that they love. Sarah and her family recently relocated from Arizona to North Carolina and they love exploring their new town. When she’s not working or playing with her babies, you can find her baking cookies, relaxing outside with a good book or binge-watching Netflix with her husband. Be careful about visiting the author’s blog. I’m on my iPhone and I kept getting rerouted to majorly spammy stuff. I don’t know why but just watch out. Hi Alisha!! Really??! Hmmm that’s super strange. I recently had some updates done but it definitely shouldn’t be taking you to spam!! I’ll try and see if I can figure out what’s going on. Thank you for the heads-up! Happened to me too, tried it 3 different times. I had to quit the app to get away from it. I am on a laptop and it is working fine. Just to let others know it may be okay for them to check it out. I clicked through to her site just fine. Thanks for sharing your schedule Sarah – I have 2 little ones (3 months and 3 years old) and I’d love to do what you do but my time is sooo tight right now! I think I need to start getting up at 5am. Also I love how your hubby does the cooking – it’s the same in our house. The extent of my prowess in the kitchen is pinning recipe ideas to show my husband – haha! Oh yes! I think having a helpful husband is the main reason I can get so much done. My girls also go to bed fairly early. They don’t always fall asleep early, but they are up in bed early. Don’t stress too much about growing a blog and starting a business with a 3-month-old!! When my youngest was 3 months I WAS trying to keep up with everything, and it was a recipe for disaster!!! Things are easier now with them on a consistent schedule!! Aww yay!! Thank you!! I have a new blog I’m working on, too! Blogging is so addictive haha! It’s perfect for moms, though – it’s a creative outlet, we can make friends and encourage each other, and the income potential is just icing on the cake! Congratulations on adopting!! I will be following your journey, too! Thanks for your post. I am just on the beginning of my working from home journey. I am different than you, however, because I have stayed home for my entire 10 years of being a mother without any income. My dear husband, has been working extremely hard all these years and I really feel it is time for me to help him out. I love the comment, “I’m sacrificing my time now, so I can have more of it, later.” I’ve never thought of it that way, but I really like that way of thinking. I will definitely keep that in mind. Hi Rosanna!! Thanks for the sweet comment. I encourage you to spend some time brainstorming ways you can make an additional income. 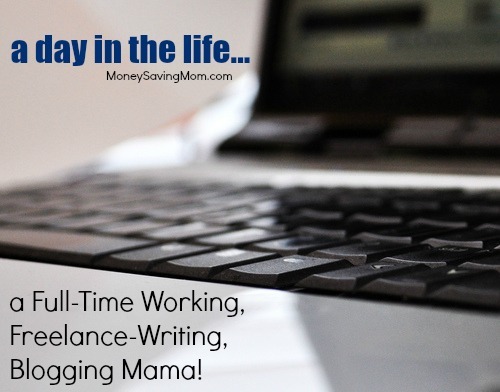 I started freelance writing when my first daughter was born. I did just 1-2 articles per month and worked on them while she napped. Slowly, I was able to increase my workload and I learned to write quicker. You would be surprised at all the opportunities that can come your way once you start!! Best of luck to you and your family!! Thanks for your reply, Sarah. I have already begun blogging and have another business going on the side. I really love blogging, but I started out just doing it for fun (which I still do) and now I have a lot to learn to know how to do it for money. I definitely keep your suggestions in mind! Sounds exhausting, but glad you’re able to do everything you want. I might have missed something, but it doesn’t sound like you have a full-time outside-the-home job. Three hours in the office in the mornings but afternoons combined with personal stuff and your blog? Do you really put in a 40-hour work week? And I’d really like to know how it takes you only 30 minutes on the weekend to do laundry for a family of four. Takes us a lot longer, and there’s only two of us, me and me teen-age daughter (who helps a lot wiith laundry). Hi Susan! Yep – I definitely put in 40 hours per week at my job, minimum! I do have the luxury or working from home a few days per week, which saves me almost 2 hours per day in commute time. I use that extra time to blog/freelance. I also wake up really early and work in the evenings after my kids have gone to bed! Sarah, thank you so much for sharing your story and giving me the motivation that I need to start a blog. I have been dreaming & wishing I could start a blog for several years now and you’ve given me the inspiration that it can be done and I wholeheartedly need to take the leap!! Yay!! That makes me so happy! Blogging has truly changed my life, and I’m not talking money-wise as I don’t bring in too much just yet. I have made so many friends through blogging, though, and have really formed a community. It’s such a great creative outlet, too. Best of luck to you!! Feel free to email me directly if you have any questions! I recently changed my attitude of working hard now to reach our financial goals sooner so that we can have more freedom in the future. You’ll always be working (maybe even in something you hate) if you don’t bust it out for a few years to reach your goals! Thank You for this post. This speaks to me in a big way as I also blog work as an instructional assistant at a local school 28 hours per week when school is in session. Thanks! That’s great!! I think anyone can run a blog since you can decide how much work you put into it! For me, I know it’ll take me longer to grow it since I do work FT and have a family, but I’m totally OK with that. I love blogging and the community I’ve formed! Best of luck to you!! I LOVE that goal!! And yes, I try to remember that every day. “Just get done what I can today; the rest can wait.” Maybe put your daughter in after-care two days a week or so? That might be a good balance!! Best of luck to you!! This is soooooo great Sarah! I’ve always been a believer that some sacrificing in the short-term will have major benefits in the long-run. I did exactly what you wrote in your article (people thought I was nuts), but you just do it. Much of my goal-setting and inspiration has come from following Crystal over the years. It’s difficult to fail with such great leaders to follow! I was finally able to quit my FT job a few months ago after going pedal-to-the-metal for 2 years, but my “side-job” has now surpassed what I used to make doing very high level Human Resources at a University. I started with a blog (a very neglected one now because of my business), but it was the catalyst to the beginning of some other extremely creative revenue generators (that I would have never thought of myself). I admire you for hanging in there! You will achieve your dream of quitting one day! I’m living proof it can be done! God bless you! This was SO encouraging!!! Congratulations to you on quitting your FT job to run your own business!!! That’s so amazing and such an incredible accomplishment!!! I do have plans to re-vamp my blog (so, I’ll be sure to visit your blog for some pointers – I need a ton of help in that area). I haven’t had to focus too much on it because fb makes things so easy and I do most of my business off-line. Nevertheless, I’m going to follow you to see how it goes for you. We crazy mammas have to stick together! And…there’s really not a lot out there that speaks to moms who work FT. I know, I’ve looked. What’s the plan for when the kids give up their naps? All three of mine gave them up at exactly age 3. First they couldn’t fall asleep at night if they napped, and then they couldn’t fall asleep in the day time no matter what. It was a wrenching transition every time! I am amazed you can get a 3 hour nap in and have them in bed (and, I assume, able to fall asleep) at 7:30! Congrats on all you are accomplishing – I love the energy!